Paul Hollywood is becoming an increasingly well-known name within baking households, whether he be standing alongside Mary Berry in The Great British Bake Off or going it alone in his own shows. 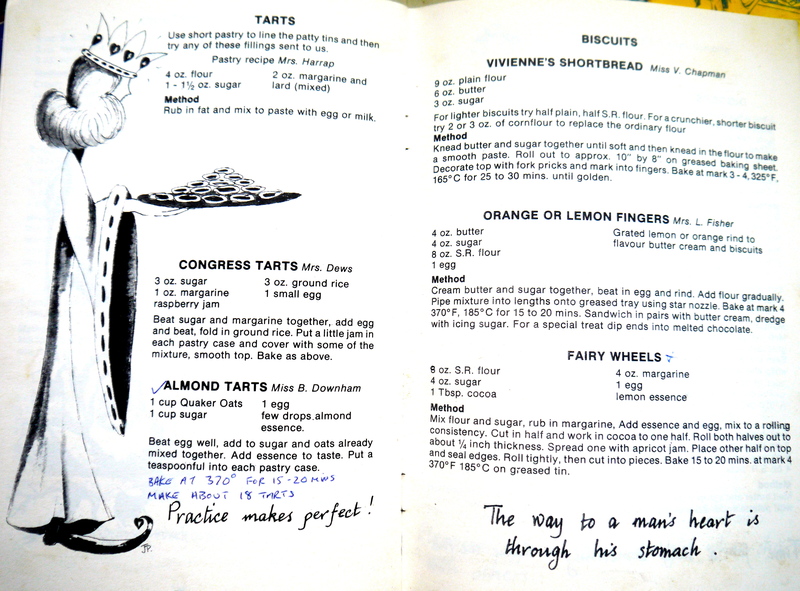 Today I decided to pick up one of his books and put his bread recipes to the test. 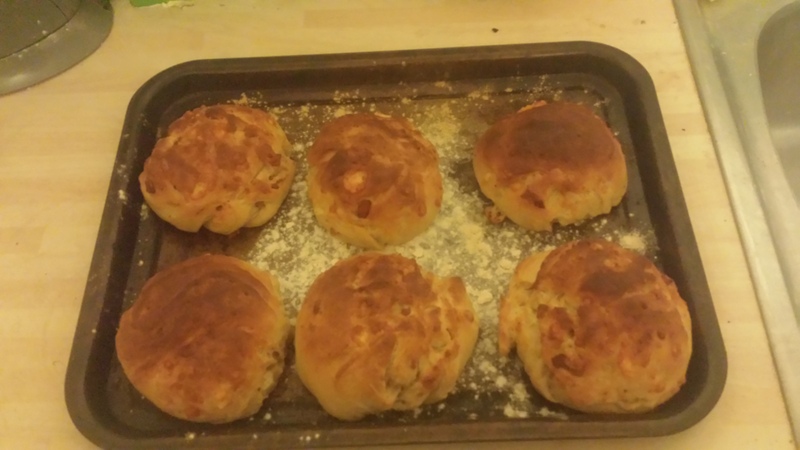 I slaved away in the kitchen all day producing three bakes: a basic bloomer, pizza bases and some cheese and bacon rolls. 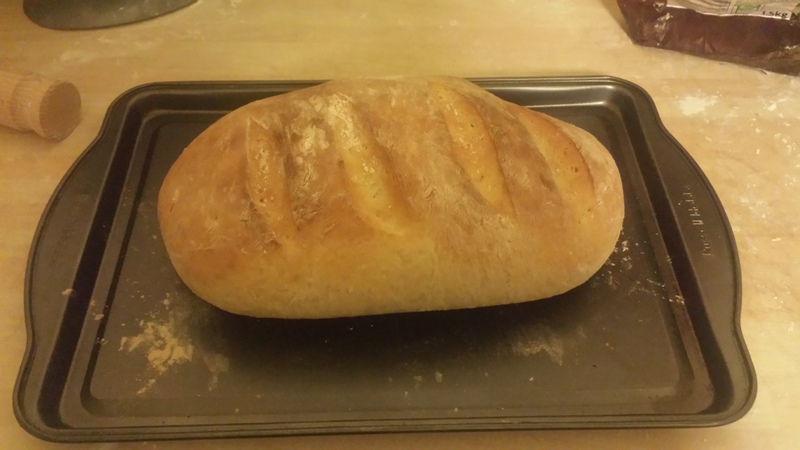 Bread is cheap and easy to make; making a basic loaf yourself can cost around 30p which for a student like myself is a bargain not to be missed! baking it yourself can have a rather rewarding feeling and with it comes the great freshly baked smell. Paul’s book is great for beginners as the first chapter outlines how to handle dough and throws out some useful pointers… after all his years of experience it would be stupid not to follow what he has to say. The Bloomer was the most basic of the breads I attempted. All that is needed is some strong white bread flour, yeast, salt, olive oil, water and you’re ready to go! but I found after making this loaf that using a spoon works just as well. 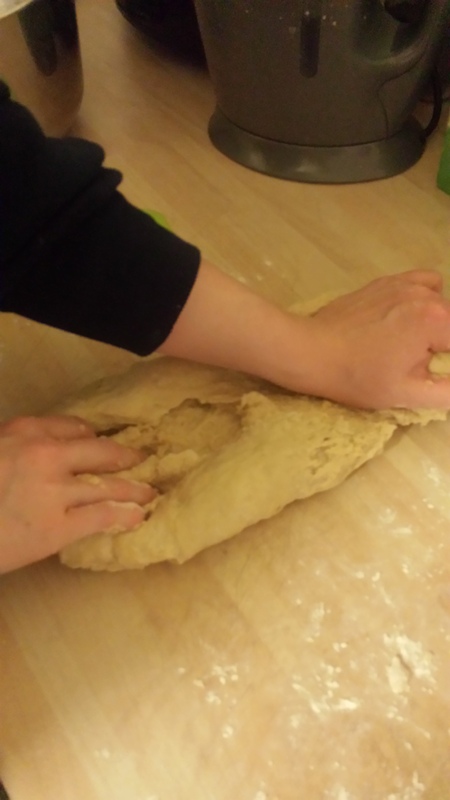 I also had the privilege of using a mixer with dough hooks for my kneading; this makes the process a lot faster and requires less physical effort. I left the ball of dough in a lightly oiled bowl with cling film over the top, so it could prove. After one and a half hours I was rather impressed by the size as what had started as my little lump of dough had almost filled the bowl! After knocking it back (taking the air out of the dough), shaping it and marking it, my dough was ready to become bread. For a first time baking bread I was really impressed with the results, I now have a nice crusty loaf, which will go nicely with some soup on a chilly day. 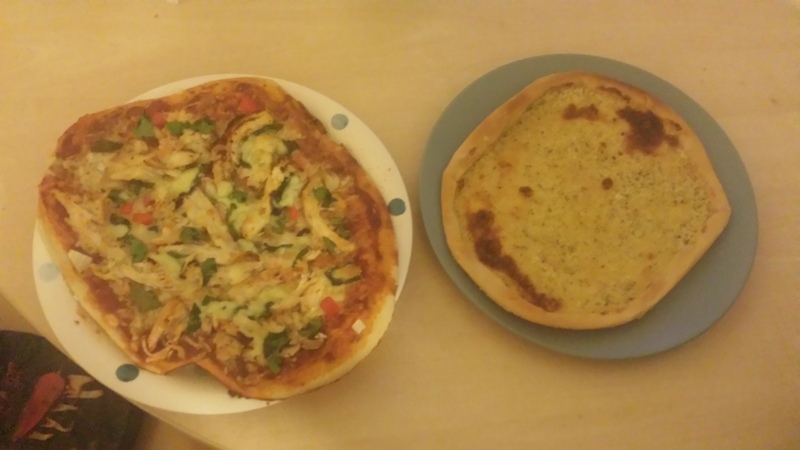 Pizza always makes a good student dinner, many times I have ordered in take out with hefty price tags… but now I feel those days are behind me as I have discovered how to do it for myself for a minimal amount. The recipe is rather similar to the bloomer, using the same ingredients in similar doses (but I would say if you have about four people to cook for maybe double what the book says). I made four bases to feed my flat, I made one of them into a side dish of garlic bread as well, and so it can be rather versatile. The main difference with this from the bloomer is of course the shape, to achieve the round shape push your palm into the ball of dough to form a roundish shape and roll it out evenly at all angles if you want the normal circular look. Mine appear to be slightly oblong to suit the shape of my trays. 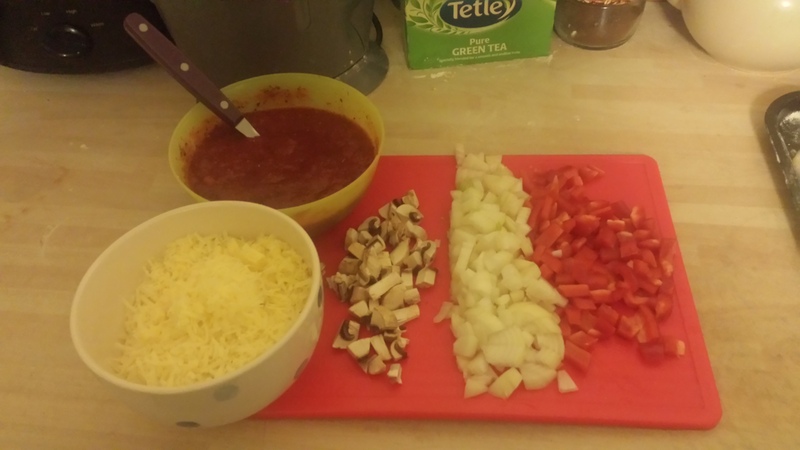 I topped my pizza bases with a mixture of chopped tomatoes, tomato puree and mixed herbs along with some grated mature cheddar, then I grabbed whatever I could find in my fridge for the toppings. For the garlic bread I made a mixture of chopped garlic, butter and mixed herbs and spread generously. The results made a great Sunday night feast, I can’t say the flat mates complained; clean plates all round! In the book Paul makes stilton and bacon rolls, but I used up the rest of my strong cheddar, which I found worked nicely also. The cheese and bacon rolls again use the same basis just with the addition of these two ingredients and some unsalted butter. It is made in a similar way also. 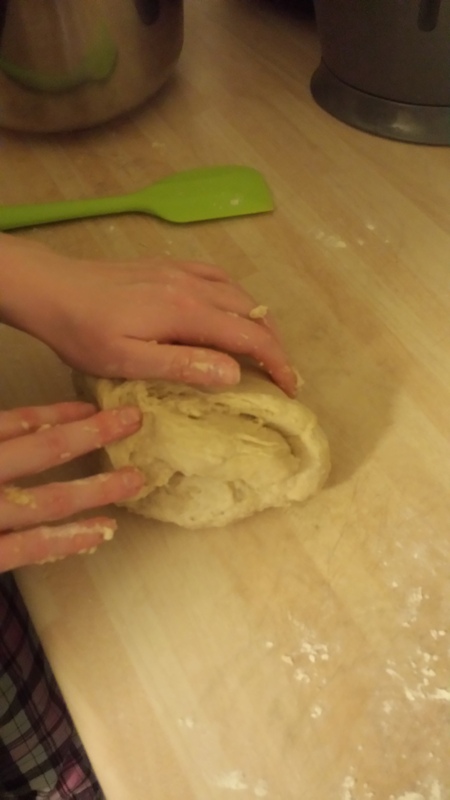 This time I kneaded the dough by hand just for the experience, and I found it to be hard work on my little arms, it probably took me 15-20 minutes before I had a decently stretched dough. It’s more rewarding doing it by hand, so I would definitely do it again, and after all that hard work you get to leave it to prove for one and a half to two hours before being faced with it again for knocking back. I shaped this one into six balls and baked. They came out nice and crusty with a soft middle and I found they make a nice breakfasty treat. 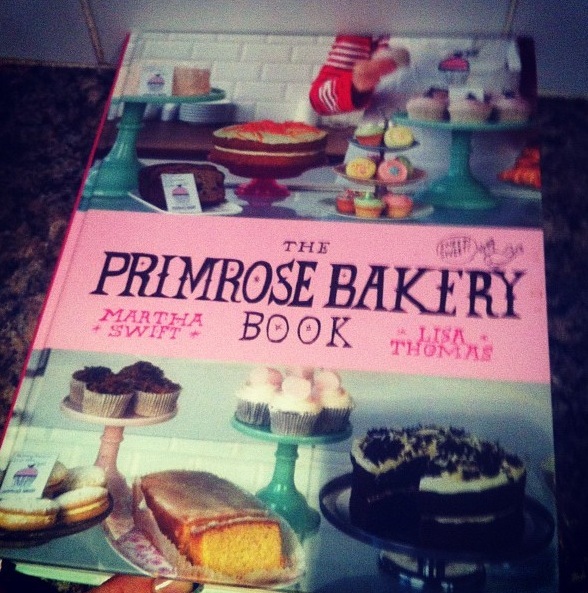 I would definitely recommend picking up this book as I was pleasantly surprised with the results of my first time bakes. There are lots of more breads to choose from, including sourdoughs and sweet breads. Paul also offers great meal suggestions as to what you can serve your breads in/alongside. 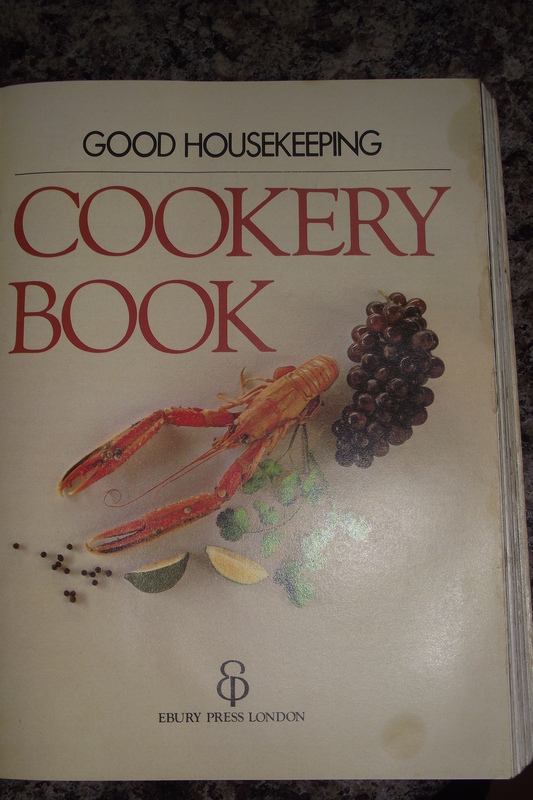 This book may be old but it’s certainly has lot of fab recipes. This tasty number will get you guys in the mood for spring, offering a rather sweet and zingy taste that is both a great pallet cleanser after a heavy meal or as a light dessert following a green salad. Now I have honestly never made a Lemon Meringue before but I decided to be adventurous and grabbed one of my mother’s old recipe books and decided to have a go. 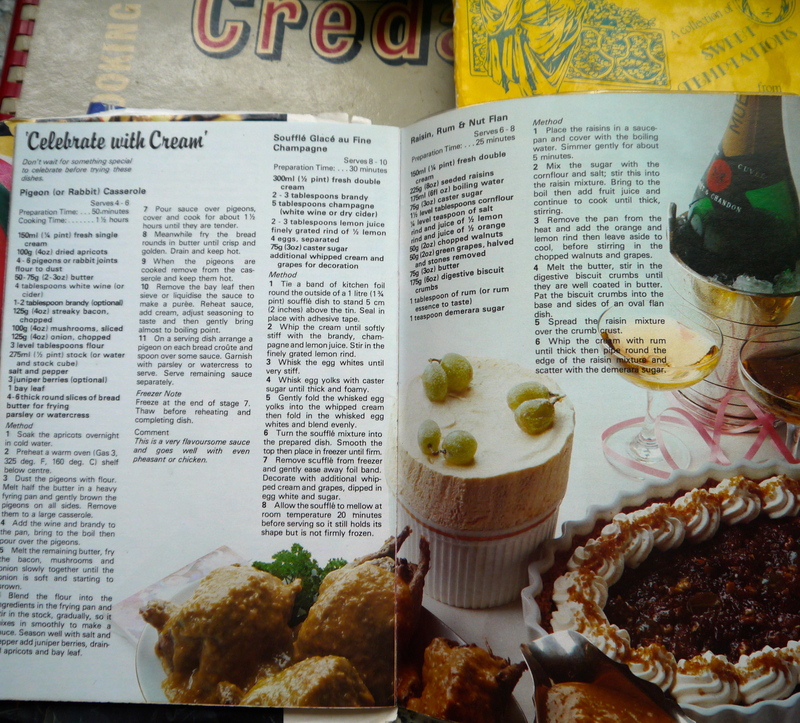 Well to my delight I found this recipe was rather easy and was very happy with my final dessert. I mean who doesn’t like sharp, zesty lemon topped with fluffy clouds of meringue that offers a sweet, but yet tangy kick. This desert is great for those of you who don’t’ want to indulge in stodgy, heavy desserts or if you don’t want to spend hours in the kitchen slaving away. Now this book was really old and I think it was given to my mother, I don’t think this edition is even in print anymore! But it was so delicious I definitely think you guys at home should try it. 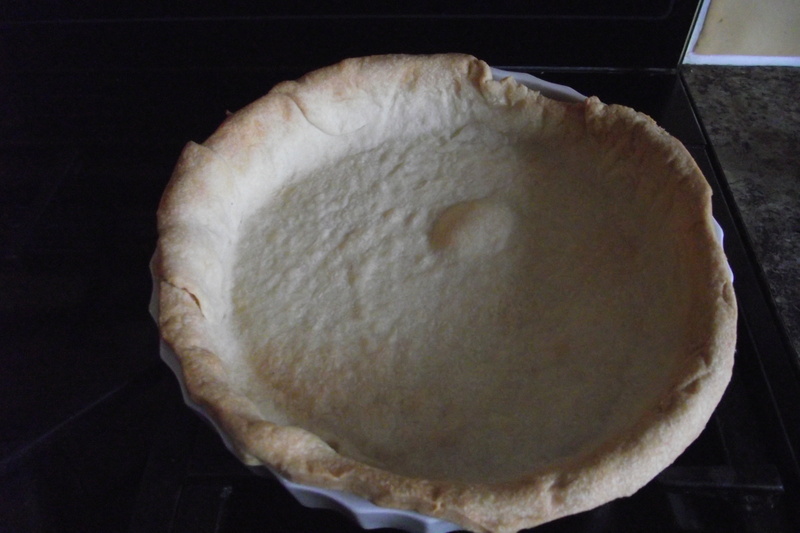 • 175g (6 oz) Shortcrust Pastry made with 175g (6 oz) or you can buy readymade pastry if you are short on time. • Finely grated rind and juice of 2 lemons. • 100g (4 oz) granulated sugar. • 75ml (5 level tbsp) cornflour. • 75g (3 oz) caster sugar. 1. Roll out the pastry on a floured surface and use to line a 20.5 cm (8 inch) flan ring or fluted flan dish. Chill in the refrigerator for 30 minutes. 2. Bake blind in the oven at 200◦C (400◦F) mark 6 for 10-15 minutes, then remove the paper and beans and bake for a further 5 minutes until the base is set. 3. 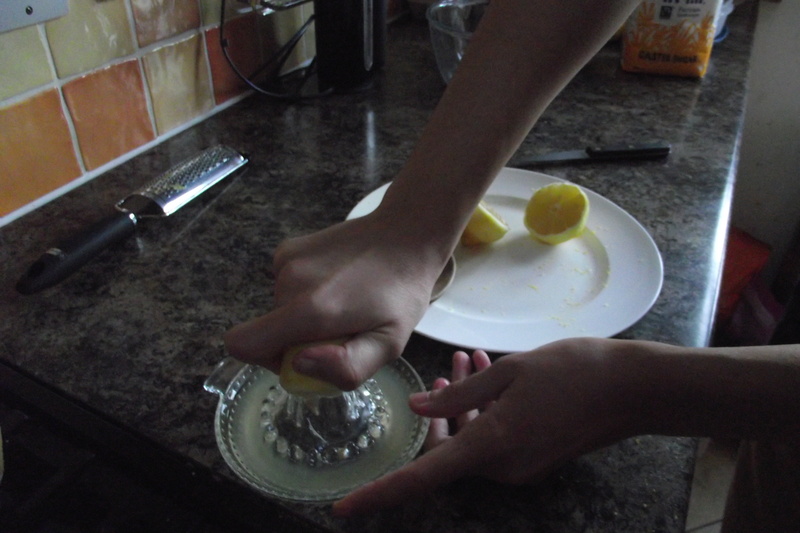 Put the lemon rind and juice, granulated sugar and 300ml (1/2 pint) water in a saucepan. Heat gently until the sugar dissolves. 5. Cool slightly, then beat in the egg yolks, one at a time. 6. 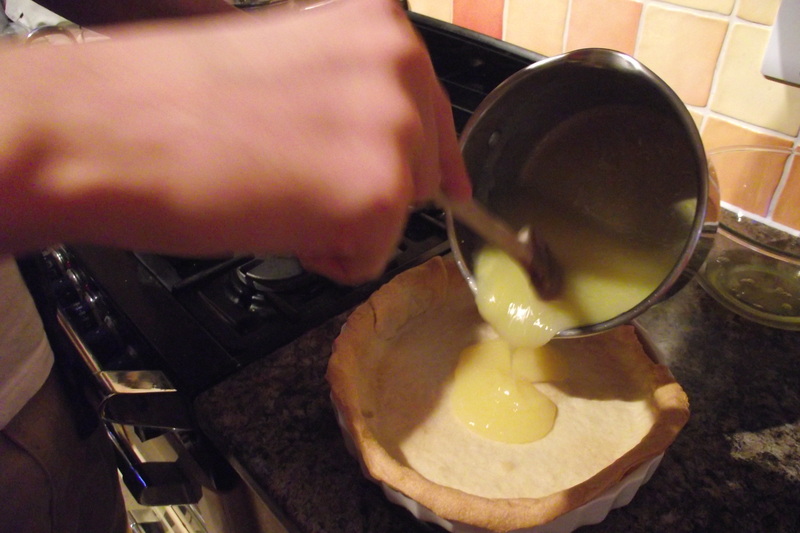 Pour the warm filling into the pastry case, levelling the surface. Whisk the egg whites until stiff. 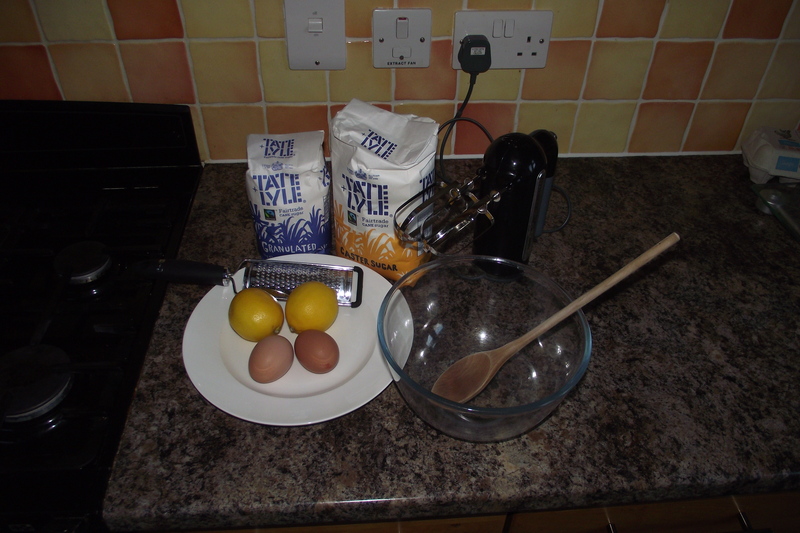 Whisk in half the caster sugar until completely incorporated, then carefully fold in the remaining sugar. 7. Spoon the meringue on to the filling and spread with a pallet knife. 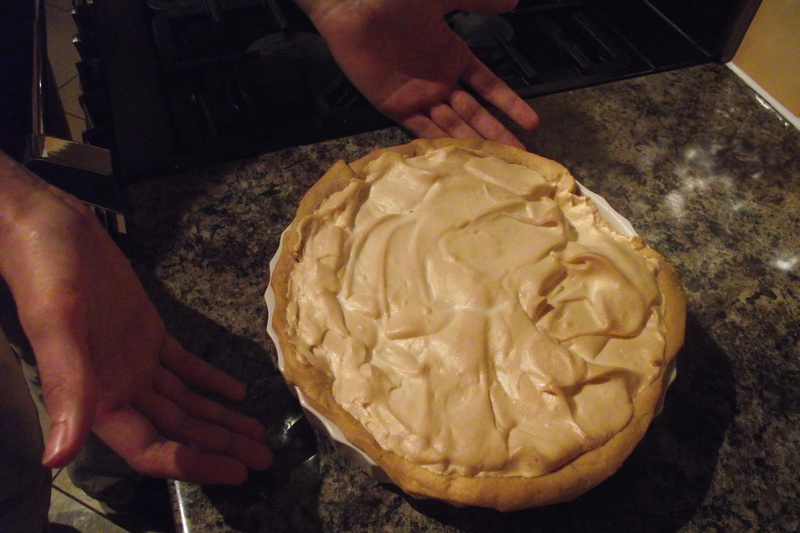 The filling must be completely covered, but the meringue must not overlap the flan ring or removing the ring will ruin the final appearance of the pie. Flick it up with the tip of a knife and bake in the oven at 150◦C (300◦F) mark 2 for about 35 minutes. Ease off the flan ring and serve the pie with cream. This is what your final dessert should look like. Minus the hands. As always please feel free to leave your comments below! I moved to Liverpool from Birmingham last year. I was shoved into halls of residence with a bunch of people I didn’t know and expected to (like everyone else) just get on with it. Make friends, go out, get drunk, complete essay after essay, cook and clean for myself, what people call “living independently” you might say. However there’s not a chance in hell I could have done it all without my dear old pal Toni. This year for her Birthday I decided to bake her something extra special to say thank you for all the lovely things she’s done for me throughout our first two years at university together. Why don’t you try this choco-vanilla cupcake recipe to show someone just how important they are to you? 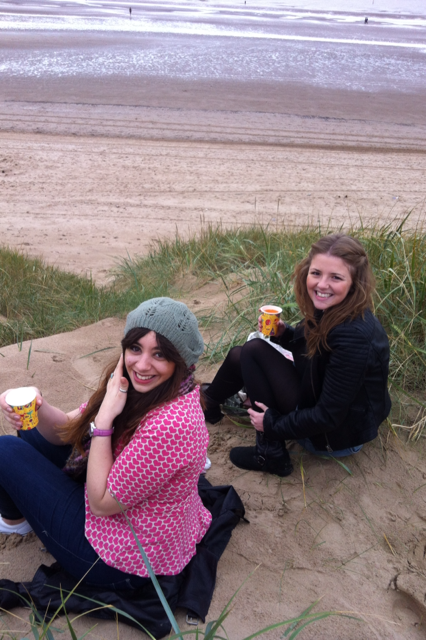 Me and Toni at Crosby beach on one of our many adventures. Before you start, preheat oven to 180C and line a muffin tray with cupcake cases, I’ve found that the deeper the tray, the better the cupcakes usually turn out. 1. Melt the dark chocolate and leave to cool for about 10 minutes. 2. 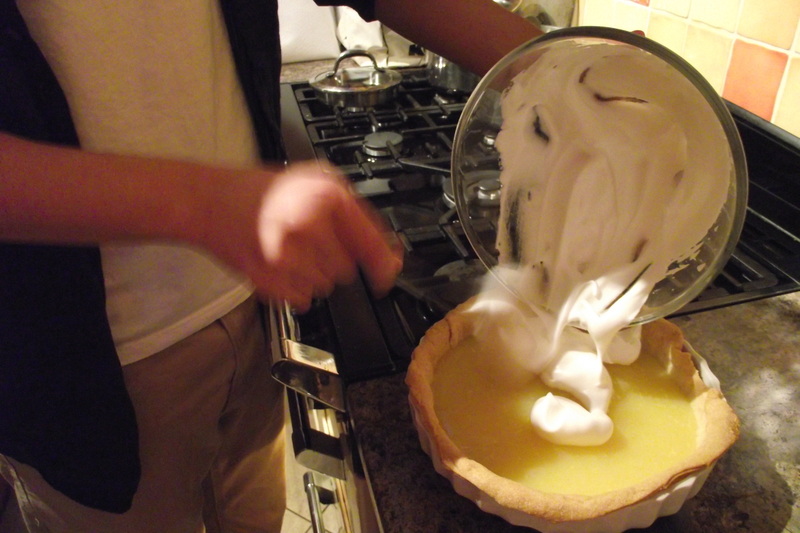 In the meantime, cream the butter and sugar together till they form a pale and smooth mixture. 3. Gradually add the beaten egg yolks to this creamed mixture, followed by the melted chocolate. Beat this together for approximately 5 minutes. 4. 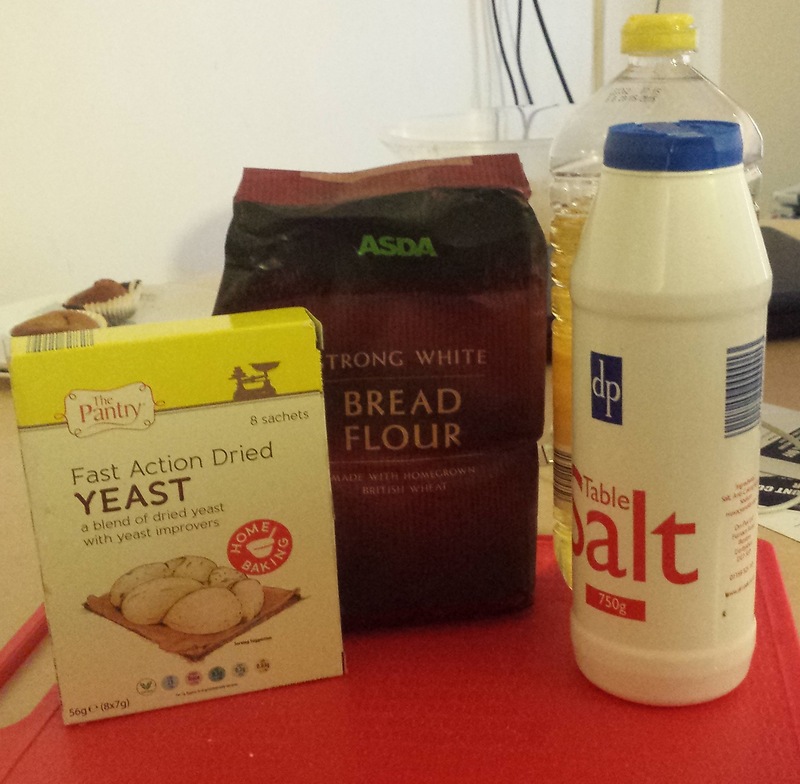 In a separate bowl combine the flour, baking powder and salt. 5. Do the same in a separate jug for the milk and vanilla essence. 6. Add a third of each separate mixtures to the chocolate batter one at a time and beat until all the ingredients have been incorporated. 7. Finally, whisk egg whites in a separate bowl till they form soft peaks and fold these into the chocolate batter using a metal spoon. Make sure you do this very gently so that the air stay’s in the mixture this will make your cupcakes temptingly light and fluffy. 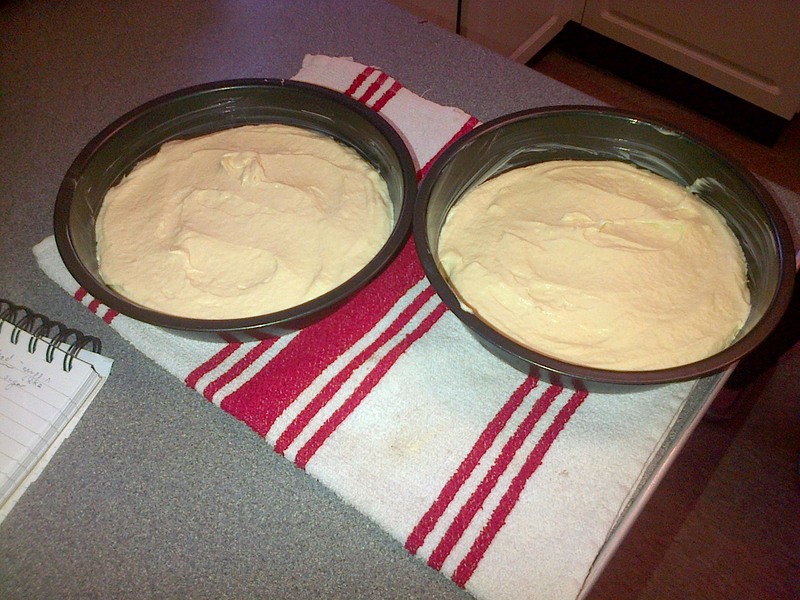 The batter should be smooth and runny enough to spoon into cases. Bake for 22 minutes or until a knife inserted into a cupcake comes out completely clean. 1. Beat together the butter, milk, vanilla essence and half of the icing sugar till smooth. 2. Gradually add the remaining icing sugar and continue beating till the mixture reaches a creamy texture. If the mixture does not feel as creamy as you think it should be, add the optional table spoon of double cream, this should thicken the mixture slightly, making it easier to pipe or spread onto your cupcakes. 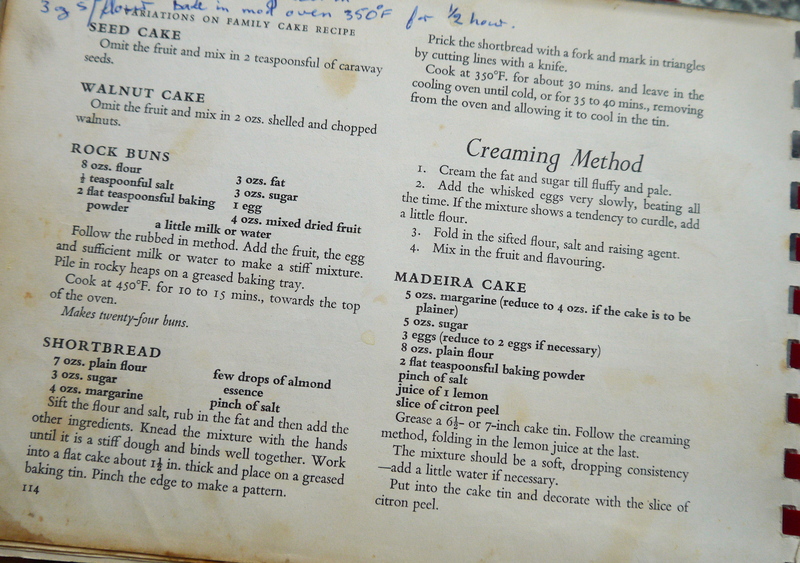 I adapted this recipe from one I found in my collection of baking books created by my favourite place, Primrose Bakery. As they are a retailer, they’re methods can be more complex so I’ve tried my best to scale it down as much as I can, to a point where we can still achieve a great taste, almost identical to that of the lovely little bakery. 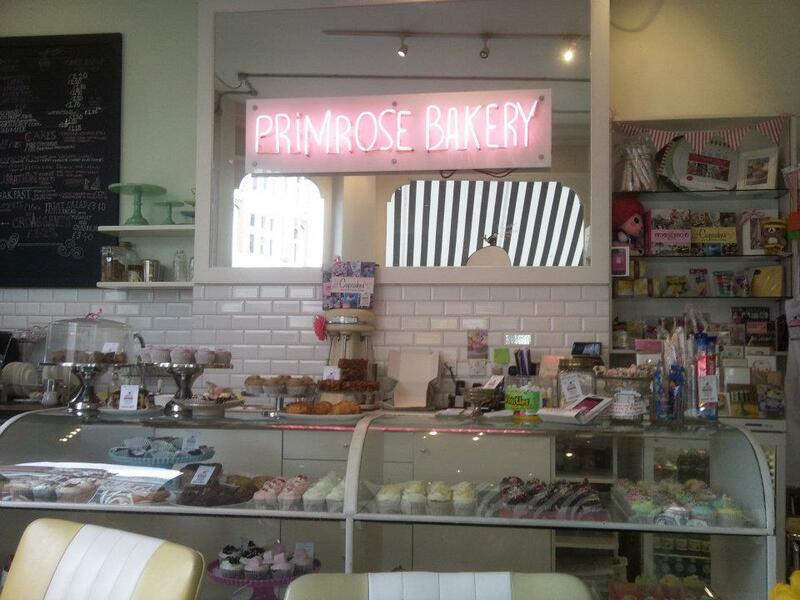 The bakery itself sits on the peaceful corner of a back street, just seconds away from busy Covent Garden in Central London, if you’re ever in the neighbourhood and fancy a sweet treat. Head down for a pot of tea and a delicious cupcake. You won’t regret it. The interior of the delightful little bakery in Covent Garden and the book itself. 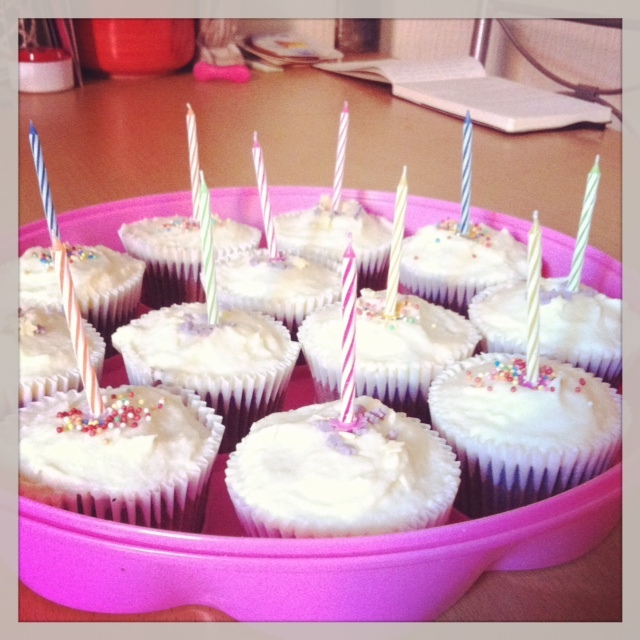 I’d love to see some of your very own “bakes for every occasion” so get emailing us with your pictures and recipes and you never know your pictures might make it onto our website! 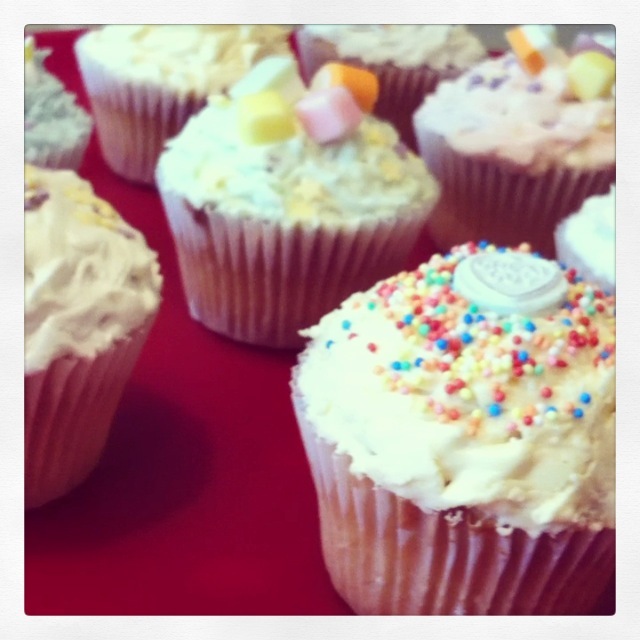 What happened to baking: Hobby or necessity? Many, many centuries ago, the first evidence of baking occurred when humans took wild grass grains and soaked them in water before mashing them into a broth like paste. The paste was then cooked on a flat, hot rock with the result resembling a bread like substance. And just like that Baking was born. Baking holds special significance in a number of culture’s, In Victorian Britain, when the Duchess of Bedford, Anna Russell grew tired of the sinking feeling which afflicted her every afternoon at around 4 o’clock ..she asked for a tray of tea, bread and butter, and freshly baked cakes to be brought to her room. Once she had formed the habit she found she couldn’t break it, so spread the word among her friends instead. As the century progressed, afternoon tea became increasingly elaborate with more adventurous sweet treats added to the tray. These days a visit to a coffee shop isn’t complete without a slither of cake. It is fascinating how just knowing the right temperature or the right quantity can create a masterpiece. I always describe myself as a better taster than a baker so amongst a tray of cucumber sandwiches and freshly baked scones I took five minutes this afternoon to chat with my baking hero my Grandma, who has been whipping up delights in the kitchen for as long as I can remember. There isn’t anything she hasn’t baked, whether it’s simple jam tarts or elaborate birthday cakes. 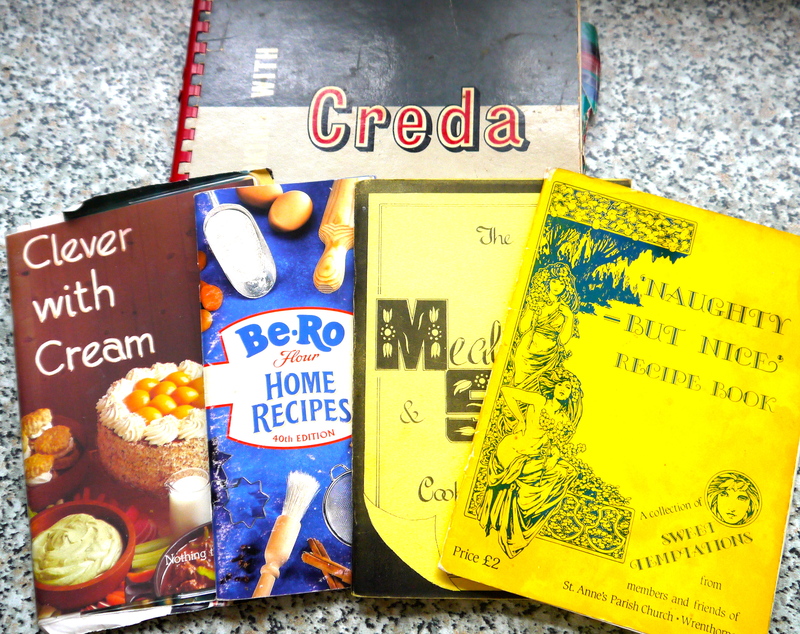 Between bites we dig out some old recipe books and talk all things baking from a time gone by. My memory’s of baking with Grandma are fond, when I was little I would be her assitant and was always allowed to lick the spoon. 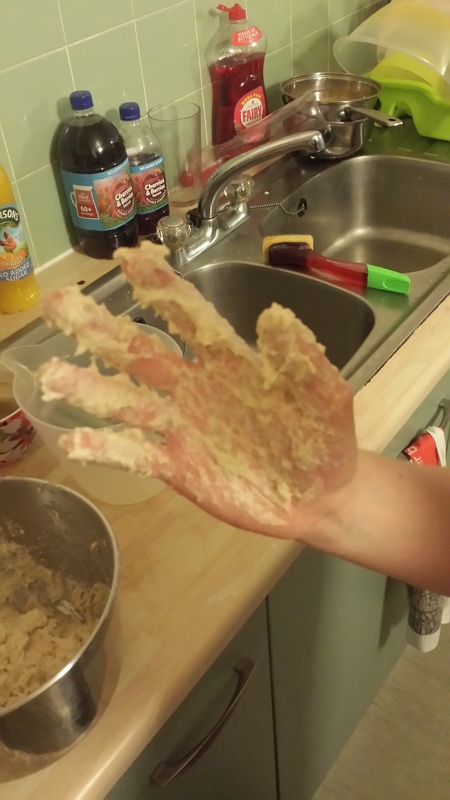 Do you have any memories of baking with your Grandma? Leave a comment below. 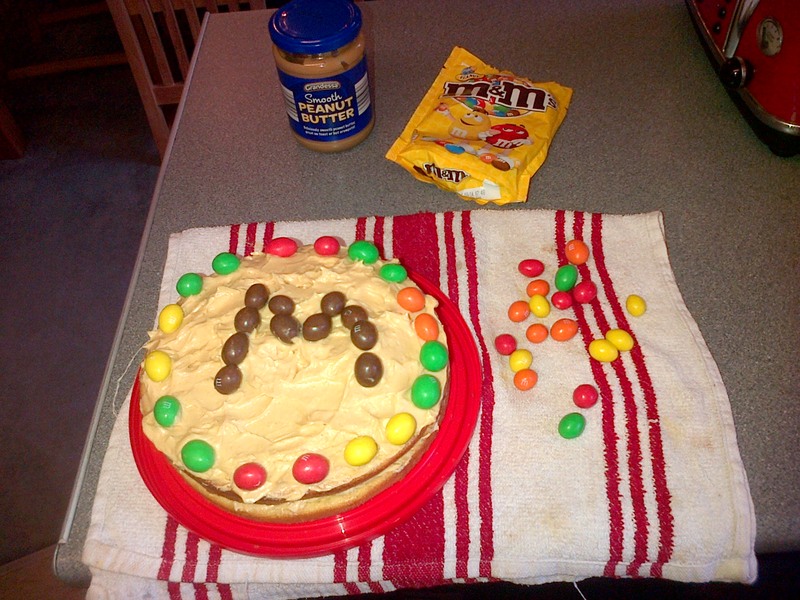 Peanut M&M Muffin Cake recipe. Whether it’s the sugar rush we get from them or the elusive feeling of love from our first bite, there’s no denying it; we are a nation obsessed with chocolate. We walk into our corner shop or into our local supermarkets and the first thing that catches our eye is the confectionery aisle. The bright colours, the temptation, the naughtiness of knowing you shouldn’t but you really should, there’s just something about chocolate that we can’t resist. Not only that, chocolate isn’t only making us happy, it’s making the manufacturers rather happy also. Chocolate is a multi-million pound industry so as long as we’re eating it, we’re keeping the big cats milk bowl full too. I decided to check out the stats of the nations favourite chocolate bars and interpret our Top 10 into household cake recipes. Let’s start from the bottom and work our way to the top. Starting with #10 on the list: M&M’s. Manufactured by Mars Confectionery, latest figures from foodmanufacturer.co.uk indicate that those colourful little pills of chocolate raked in £66.9m by the end of 2013. Plain milk chocolate M&M’s were first introduced in 1941 by Forrest Mars. Jr, son of the founder of the Mars Company, Frank C. Mars. Not as convenient as they are today, the idea for M&M’s came during the Spanish Civil War (1936 – 1939) when Forrest saw soldiers eating chocolate pellets with a hard outer shell to stop the chocolate melting. A big packet of Peanut M&M’s! 1. Preheat your oven to Gas Mark 5 (190°) for half an hour. 2. Grease your cake tins with margarine, just so they’re ready to go straight into the oven once you’ve put your cake mix in them. 3. 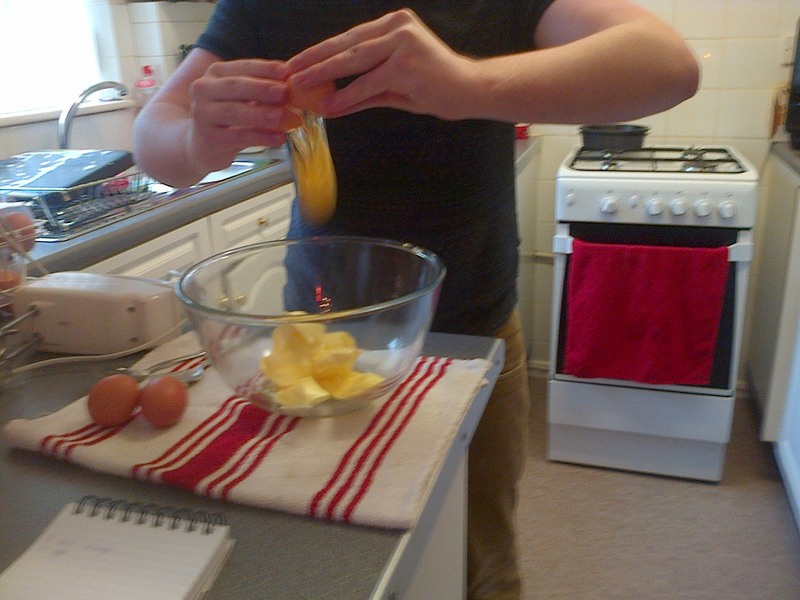 Crack your eggs into a mixing bowl and add the margarine, self raising flour and caster sugar. Whisk! This is known as the “All In One” method, so it doesn’t really matter what order you put your ingredients in. After all of the ingredients are mixed together, add a splash of milk. I go for full fat, but you can use skimmed or semi skimmed if you like. 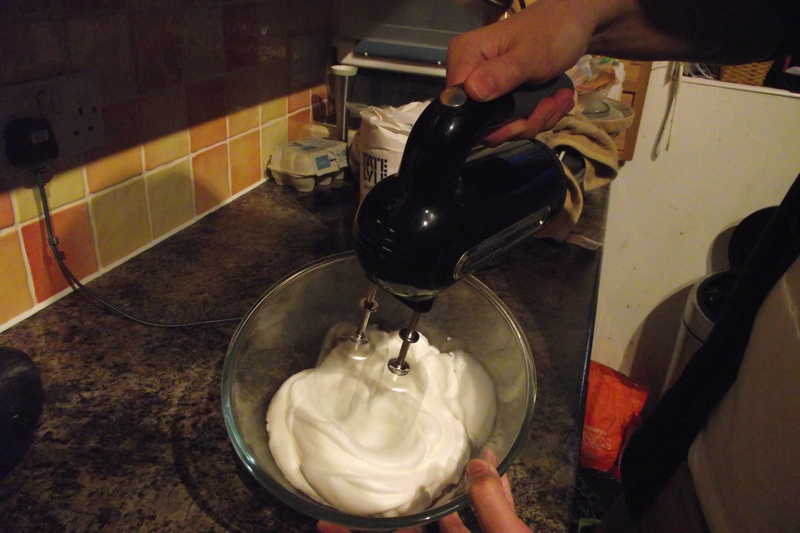 Whisk again for a light and fluffy texture. 4. Spoon half of the mixture into one cake tin and the other half into the other. Bake for 15 minutes and check to see if the cake is rising. Little tip: stick a tooth pick into one of the layers and if the toothpick comes out clear, that means the cake mix is fully cooked. Don’t take your eye off the cake layers after this: it can burn very easily. Check again after another 5 minutes and they should be ready! 5. 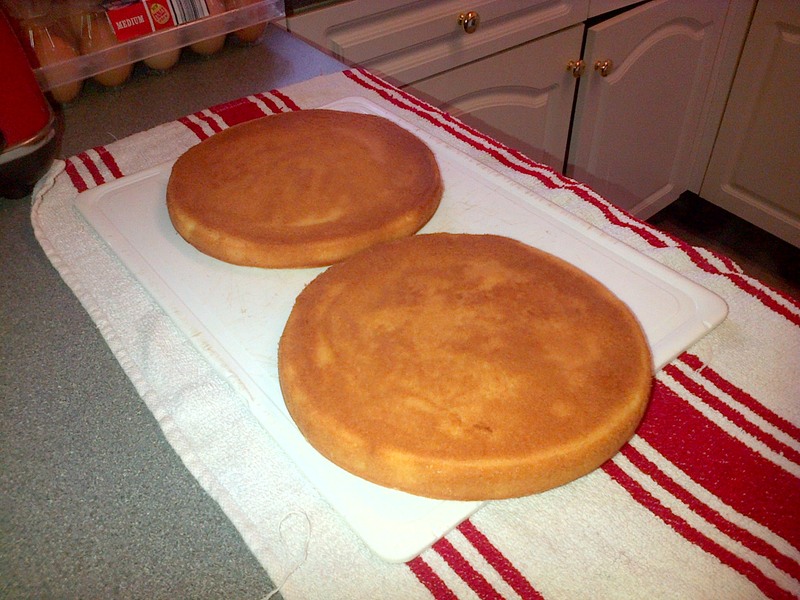 Once your cake is cooked through, place the cake tins on a tea towel on the side and allow a good half an hour to cool before you fill and ice the cake. They should look something like this when done. 6. 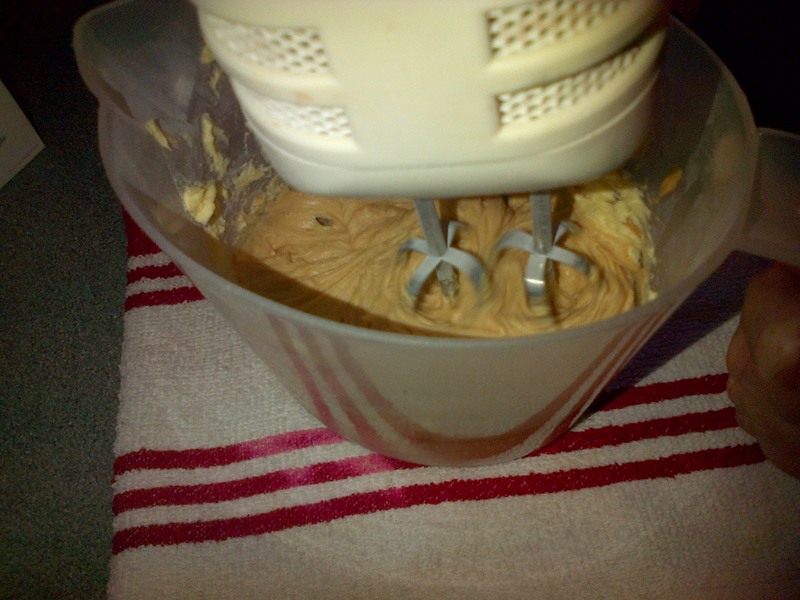 Whilst your cake is cooling, it’s time to make the peanut butter cream. 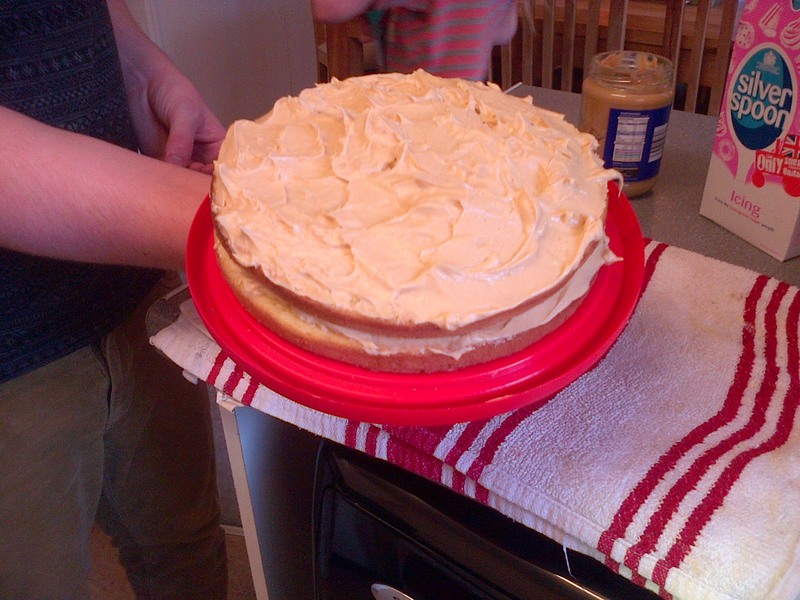 To do this, place your peanut butter, icing sugar and butter into a jug and mix! It’s that simple! And tastes like heaven. 7. 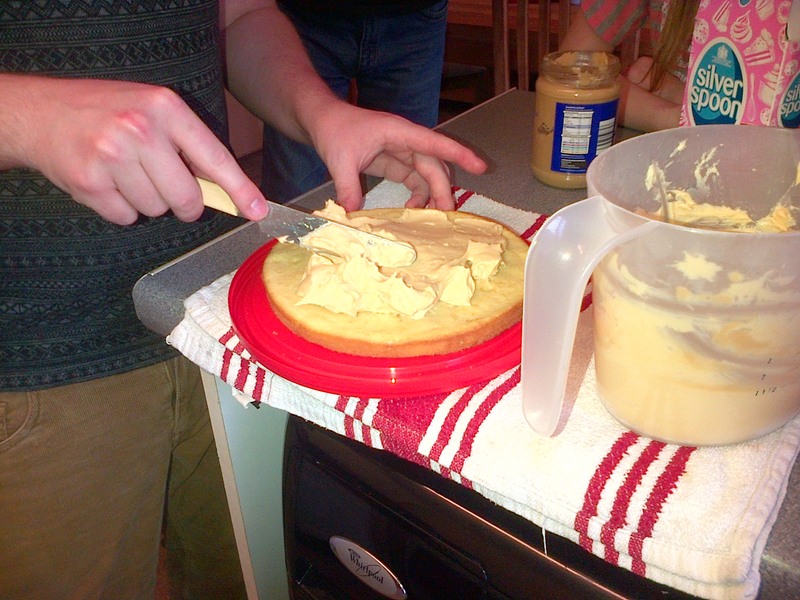 Spoon half of the cream onto the bottom layer and proceed to put the top layer on. Make sure you do not push the cream into the cake with the knife, make sure you are spreading it upwards as this makes for a better a effect. 8. Once you have done this, repeat step 7 but on the top layer of the cake. 9. After you have done this, get your packet of peanut M&M’s and place them on however you like! I went for an M&M M in the centre and various coloured M&M’s round the edge. 10. Eat. Eat until it’s all gone. Perfect for pudding or as a tasty little treat. Serves 8 if you’re skimpy with the portion size: it lasted about two minutes in my house! 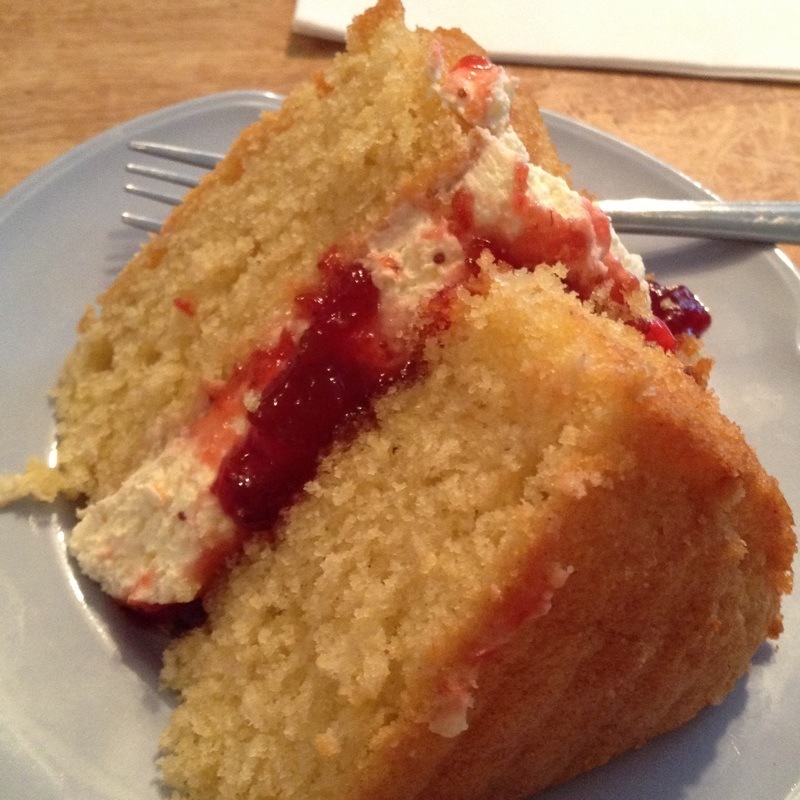 The Victoria Sponge has been around for decades. It is an old favourite that is held close to all British bakers’ hearts and is a national favourite. But before I go onto how you make this classic, I will briefly give you a quick history lesson about this simple but yet delicious sponge came to be. To start off where did the name come from? I guess the clue is in the name of the cake, as the Victoria in question is that of Queen Victoria who reigned over Britain for the best part of the 19th century from 1837 to 1901. 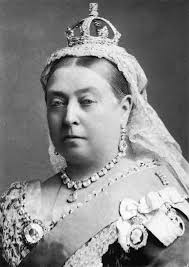 Victoria’s reign was noted by historians as being a ‘golden age for Great Britain’ the industrial revolution was in full swing, and the commonwealth was forever expanding. Some of you historians out there may now that the phrase ‘’the empire on which the sun never sets” was coined as an adage to the nations curiosity to seek and find new resources. Some of the findings have become key ingredients that we now use in our daily lives and no baker could live without the likes of sugar, cocoa, herbs, spices and coffee. So as a result the sponge was made for the Queen by Anna, the Duchess of Bedford who was one of Queen Victoria’s ladies in waiting. She made small little cakes and named them after Victoria as homage to her successful reign. Soon these cakes where served at the numerous banquets and tea parties Victoria held; it wouldn’t be long till they made their way into the nation’s hearts and homes. 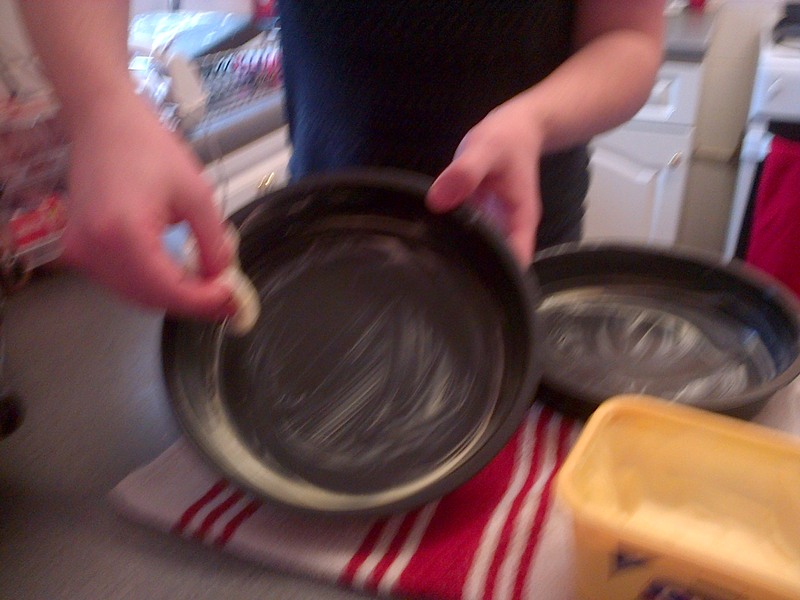 Technique: Greasing and lining cake tins .Greasing and lining cake tins. Technique: Creaming butter by hand .Creaming butter by hand. 5. Fold in the flour using a large metal spoon, adding a little extra milk if necessary, to create a batter with a soft dropping consistency. 10. Grab a plate and enjoy! If you enjoyed this guide please comment below.